The UX model under water: with oil filling on the left aud without it on the right (for comparative purposes). Our HYDRO watches are all equipped with a temperature-stabilized quartz movement and powerful, long-lasting lithium batteries. Because they require oil, HYDRO watches must be quartz watches, as the oscillation of the balance in a mechanical watch would be unable to overcome the friction resistance of a liquid. Absolutely free from fogging, pressure-resistant at any accessible diving depth and perfect readability from any angle under water – these are the unbeatable advantages of our diving watches equipped with HYDRO Technology. How does it work? The movement, dial and hands are immersed directly in a crystal-clear bath of oil. The watch is thus free from fogging, as there is no air inside the case. Filling the HYDRO watch case. The model shown here is the UX GSG9 (EZM 2B). In a HYDRO watch case, the movement, dial and hands are held in a crystal-clear bath of fluid with the same refractive index as that of the sapphire crystal glass. This means that the light reflected by the dial and hands is not refracted as it enters the sapphire crystal glass. The fluid is also incompressible. It replaces the air inside the case which inevitably contains moisture. This yields a whole range of advantages. The latest generation of our HYDRO watches, the UX (EZM 2B) series. 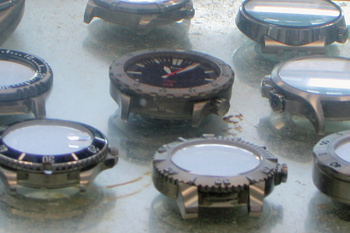 Compared with diving watches of other brands. 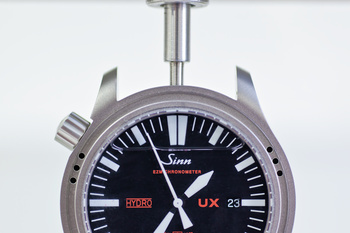 Thanks to Hydro-Technology, Sinn is the only brand that facilitates reflection-free, underwater viewing. 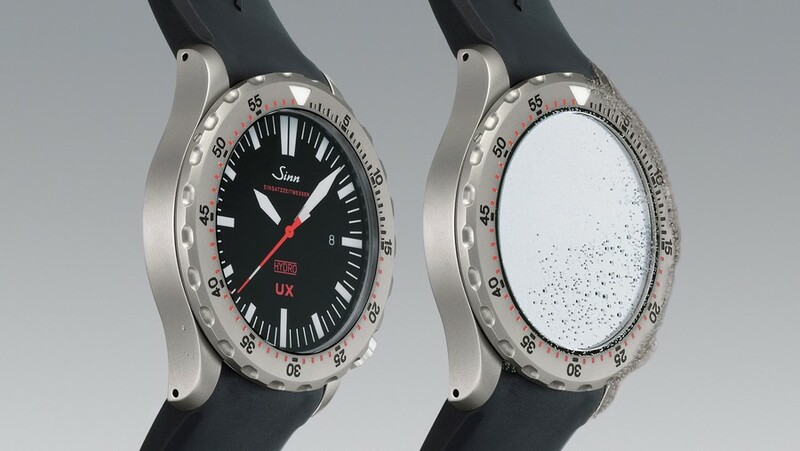 The crystal of a conventional diver's watch will unavoidably reflect light under water - but not a HYDRO watch. A HYDRO watch can be read from oblique angles under water, just as it can when out of water. The reason for the characteristic mirroring effect is the total reflection on the bottom of the crystal. If the optical medium of sapphire crystal is succeeded by the medium of air (looking towards the dial), the light will only be reflected and no longer refracted from a certain angle. This prevents the light from penetrating the interface between the sapphire crystal and the air-filled space containing the hands. From this angle, the effect is similar to that of looking at a mirror. The hands are no longer visible. Replacing the air in the cavity containing the hands with a fluid which shares the same optical characteristics as the sapphire crystal glass neutralises this effect, making the watch face fully readable even at highly oblique angles. The absence of any air inside the case keeps our HYDRO watches completely free from fogging. Fogging only occurs in air which contains moisture; this can condense if the temperate falls below the “dew point”. Where there is no air humidity - there can be no condensation! Fluids are virtually incompressible. The membrane back allows the internal pressure of the watch to adjust constantly to the external pressure. Thus the HYDRO watch is pressure-resistant at any accessible diving depth. The pressure load which otherwise builds between the internal assembly pressure of a watch (1 bar) and the external water pressure (which increases by 1 bar per 10 m depth of water) does not arise in a HYDRO watch.